The Tel Mora Independent Press is a publication centered in the Telvanni city of Tel Mora. We encourage the pursuit of intellectual enlightenment through literature and exploration. Join us as we peel away the layers of the Aurbis to reveal the deepest recesses of experience and truth. 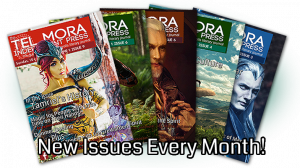 The Tel Mora Independent Press is a collaborative work of like-minded individuals who have a passion for The Elder Scrolls lore while engaging in creative works that examine literary, psychological, religious, philosophical, and societal ideas. We don’t believe TES is just a game series; we believe it is much more than that. We specialize in narratives, prose, poetry, articles, and serial stories that investigate what TES lore can be. We operate under the notion that reality within the TES universe is subjective and to be determined by the individual, rather than by an objective set of blurry and contradictory half-truths. Lore is what you make it. Want more content? Join The Tel Mora Independent Press‘s official lore Facebook group, The Dreamsleeve, and discuss lore, philosophy, literature, and art with the Tel Mora’s staff! We also have a Discord and Twitter! All works submitted are owned by their respective creators and all works are submitted voluntarily for the good of this publication and the TES community.